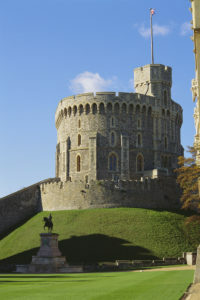 The Georgian Papers Programme is expected to take ten years to complete, with the core cataloguing work taking place within the walls of Windsor Castle, in the Royal Archives and Royal Library. The Programme’s principal partners are the Royal Archives and Royal Collection Trust (RCT), King’s College London (the academic lead), the Omohundro Institute of Early American History and Culture (lead American partner), and the College of William & Mary. The Programme has taken an ambitious approach to developing an integrated workflow that simultaneously supports access, cataloguing and dissemination of digital facsimiles and transcriptions to create a virtuous feedback loop between the expertise of archivists and academics. The Programme has two ultimate ambitions: to optimise public, freely available access supported by enhanced metadata and interpretation; and, to provide a collaborative workspace in which scholars may explore, interrogate and manipulate data using a variety of online tools. Mass digitization of cultural heritage objects is an urgent need: In Germany, this is the common ground on which stakeholders from multiple fields have formulated a “wake-up” call to political decision-makers. Whether perceived as the last chance for the preservation of soon-to-be-lost culture, as in Syria (e.g. the Syrian Heritage Archive Project), or as an opportunity for education and inspiration through free access to museum objects (e.g. Europeana), digitization enables people to see and use cultural material beyond its physical limitations. 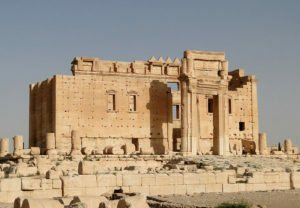 This photograph of the temple of Bel at Palmyra, Syria, destroyed by ISIS in 2015, is an example of the kinds of material collected by projects like the Syrian Heritage Archive Project. As research on these objects is a key factor in achieving these goals, digitization methods should meet academic quality standards and the large scale of the work to be done demands coordination. Within the humanities research community, the combination of digitized sources and digital technologies has propelled innovations and led to new methods which have been grouped under the term digital humanities. I was attending an authors’ workshop in Vienna on the first days of October, a bunch of Austrian, German and French scholars are preparing an anthology on practices and perspectives on digital humanities. A stunning experience, since this was much more than your standard conference, but an internal meeting of like-minded colleagues who pursue a cultural studies perspective on the digital turn, just as I am trying to. No “proper” papers were given, it was more of an open discussion, “thinking aloud” together, exchanging thoughts, stimulating new takes on the topics discussed, challenging seemingly fixed views on the matter at hand. A very fluid process in a way and even somewhat demanding, a fact that often made me sitting silently because so many thoughts were running through my head. Plus I had a bad sleep on the one overnight stay I had, so the second day I wasn’t that lively. I was the first to present some thoughts and I had chosen to propose a contribution on digitization “as a cultural technique” as I had called it first. Honestly, I chose the title since I thought it sounded cool, as I even admitted in my presentation. I then had chosen to change it to “digitization from a cultural studies perspective”. Now I am not even sure that is better…but the good thing was the openness that lay at the core of the workshop. So it was accepted that everyone came with unfinished thoughts, first drafts, albeit the level of elaboration differed. I had been so naive as to have a take on digitization in a very concrete manner, namely the process of retrodigitization of archival or library material. When the discussion began, I instantly became aware of how little I had thought of the societal and broader cultural context of “digitization”. It wasn’t something I had never thought of, just when scribbling down some loose thoughts on what I would be trying to achieve with my contribution, it was all in a hurry and for the sake of having something to lean on during my performance. The overall idea that I will maintain however, is that one should not see digitization as simply the technical process of transferring an analogue original into digital form. Instead of narrowing it down to the scanning or photographing or transcribing of the primary material, there are many steps in the process of digitization which are based on scholarly competence, intellectual resources and cultural bargaining processes about the standards and methods to be used. What’s more – what good is a digitized source when it rests unused on some server nobody knows about? So, dissemination is one of the key elements of anchoring the digitized material among the users. We’ve been given scarce time to work out our contributions for mutual commenting among the authors. Sitting here, trying to elaborate the initial thoughts I had, I am sitting with my notes from the discussion and I notice how demanding it is to come up with a 20-page explanation of what digitization actually is. I am assuring myself that there is neither a possibility nor even a necessity to believe it has to – or even can be – exhaustive.